Today brings the first of our fieldworker blog series, with monthly posts written by our fieldworking team who originate from across the globe. The first comes from Maria Mangion, a Maltese native now living in Glasgow after studying here. Enjoy! What could Malta and Scotland possibly have in common? If you’ve never lived in any of these countries or you’ve only had the chance to inhabit one or the other in your lifetime, you’d be forgiven for volunteering a ‘not so much’ or ‘nothing at all’ to this (very) random question. With Glasgow – Scotland’s largest city and its major economic hub – tucked away in the northernmost regions of the UK and sharing the same latitude as Moscow, Malta – contrastingly classified as one of the southernmost points in Europe, as well as the smallest member state of the EU – is like one of those semi-crazy distant relatives whose name crops up every year at the annual Christmas family gathering, yet no one actually knows whether this person’s life is real or an urban myth spun by your great-uncle after one too many drinks. True: on paper, the notion of common Maltese and Scottish ground reads like a comedy of errors. But the advantage of having experienced life in both countries quickly turns these preconceptions to dust. As a Maltese national residing in Glasgow for 18 months and counting, I’ve been in Scotland long enough to start spotting some quirky similarities between the Scots and the Maltese, and their cultures (and no, it’s not the number of sunshine hours in a year, sadly!). For this investigation, a curious starting point was The Crystal Palace on Jamaica Street in Glasgow – a favourite watering hole among old-time patrons and young revellers alike. This well-known, beloved pub is situated right in the heart of the city centre, where on weekend nights you’ll be greeted by the drunken banter of dozens of city-dwellers: from the group of fifty-somethings ordering the umpteenth pint for their colleagues after a hard week’s work, to the gang of clubgoers downing the last round of shots before they hit the dancefloor. The notoriety of the drinking and partying culture in Glasgow has been painstakingly earnt – Glaswegians give anyone (even Scottish people who aren’t from Glasgow) a run for their money when it comes to letting their hair down and amusing themselves silly. But, you may ask, what has this got to do with Maltese culture? A great deal, in fact. While it’s not an entirely unique trait defining the Maltese people, they too are keen on their downtime, and if you had to interview Maltese people in the 18 – 50 age bracket, there’s a pretty good chance that most of them would describe their pastime of choice in much the same way Glaswegians show us what they like to do best. And – surprise, surprise! – there’s a cultural establishment that goes by the name of Crystal Palace in Malta too. This quaint ‘tea and coffee bar’ (as the shop sign meekly states) in Rabat, a town neighbouring the island’s ancient capital city, has a lot more going on than its simple exterior and even less pretentious interior suggest. For starters, it’s the best place to go to in Malta for one of its national culinary treasures – the diamond-shaped, heavenly nuggets of ricotta or mushy peas that are pastizzi. Locals flock to this unassuming tavern to consume these oily delicacies in the wee morning hours after a rambunctious night out in the nearby clubs. The Maltese and the Scots share the same habits of pleasure: they appreciate a hard-drinking session and never say no to a party, and when the dance- and alcohol-fuelled stomach grumbling ensues, they head straight to the shop for a sinful munch on the way back home. Who in Glasgow hasn’t heard of the controversial cult of the deep-fried Mars bar, or the deep-fried variation of the classic known as the Pizza Crunch? Both cultures have an innate taste for greasy food that cures hangovers before they happen. While The Crystal Palace in Glasgow is mostly responsible for creating those hangovers, the Crystal Palace in Malta makes sure they’re kept at bay. Hurray! 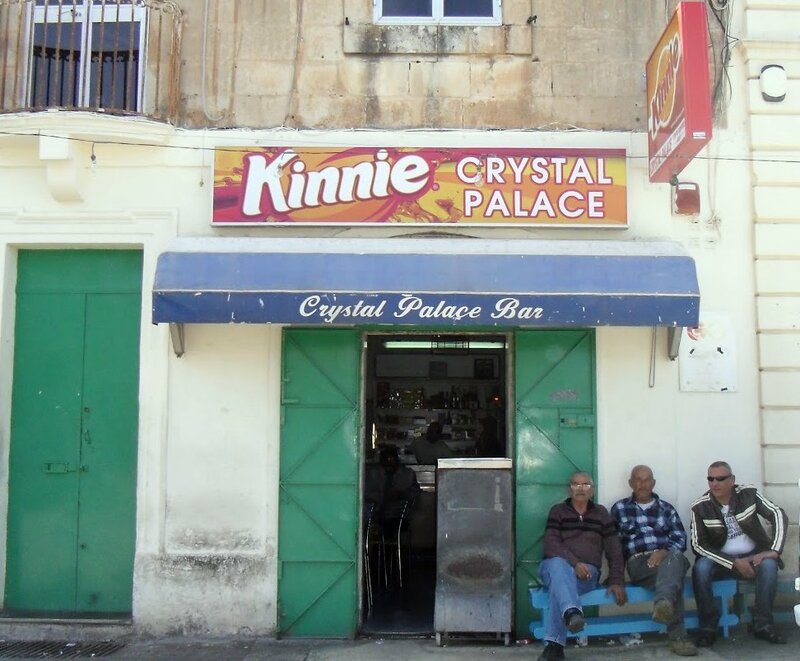 Like Scotland’s national soft drink Irn-Bru, one of Malta’s finest exports is Kinnie. Emblazoned on the Crystal Palace’s outdoor signage, the nation’s very own soft drink is a popular beverage among the Maltese (and even foreigners), and like Irn-Bru’s peculiar bubblegum taste, Kinnie boasts a unique bitter orange flavour that wins the palate of as many folk as it drives away. Moving on from the materialistic side of things to a more human level, Glasgow’s reputation for being home to some of the friendliest, kindest souls you’ll ever meet and also the most volatile, hot-blooded individuals you don’t want to meet is undeniable. Despite being separated by more than 3500 kilometres’ worth of sea and land, Malta is another such place where you’ll be positively astounded by a stranger’s caring and loving attitude, and positively terrified when you’ve had the misfortune of bumping into someone who’s having a bad day. They say that the warm, compassionate energy of Glaswegian is an effort on their part to compensate for the cold, dismal weather plaguing Scotland all year round. Some Scottish people I’ve encountered even go as far as to apologise for the clouds and the rain, in a typically British, high-mannered fashion! The Maltese certainly feel no need to make up for the lack of sun on their Mediterranean island; rather, they are the sunshine of Malta themselves, and have a natural ability for foreign hospitality. Both the Scots and the Maltese express their friendliness through a healthy amount of playful chatter too. There’s never a missed opportunity in either country to make a dull day brighter or time pass quicker with a nice dose of light-hearted, humorous conversation that whisks all worldly troubles away, even if for a fleeting minute. For a Malteser to integrate with the Weegies, it’s been an absolute breeze and a blast. As the old adage goes, distance is only relative to the heart. What are the differences that you notice between Glasgow and your home country? Let us know in the comments below! Check out Maria’s other work at her blog, or follow her on LinkedIn or Twitter.